He certainly did - last March, Trump signed the $1.3 Trillion omnibus spending bill, which provided massive increases in funding for the Military (which of course was not needed). How easy it is to spend other people's money! The leftist extremists have become so intoxicated with Marxist ideology that they have are oblivious to reality. Trump Derangement Syndrome. It started as a joke, but it's become real. Just watch Bombshell Du Jour with Rachel Maddow on MSNBC. Each day, a new scandal surfaces which will crush the presidency. But nothing ever materializes. Last night's scandal is soon forgotten, and some other silly scandal gets hoisted up the flagpole each day. Nobody salutes, and the process repeats, over and over and over. These poor (MSM) people haven't a clue how stupid they look. On the surface, it's kinda comical, but on a deeper level, it's kinda pathetic. AOC's GREEN NEW DEAL promises government handouts to anyone who is unwilling to work. The cost of the GREEN NEW DEAL is so astronomically high, AOC refuses to name the price of her plan, but conservative estimates have placed it close to $40 Trillion over 10 years. Grab your ankles Taxpayers, and bite down on something. This is really gonna hurt. 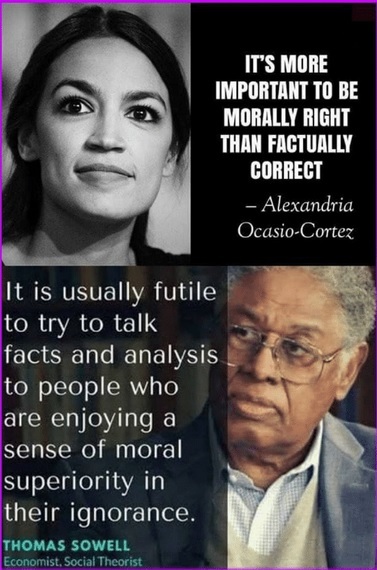 Thomas Sowell is one of my heroes. ¡Ocasio! is one of my zeroes. AOC's extremist ideology is a threat to the liberty and well-being of the majority of Americans. She wants government to ban gasoline-powered cars and ALL forms of transportation which use petroleum-based fuels - passenger cars, trucks, ALL civilian aircraft, commercial jets, diesel locomotives. .. . ALL of it. If her idiotic plan were to be implemented, it would cause our entire economy to collapse, tens of millions of Americans would be out of work, and it would turn the US into another Venezuela. OAC is too ignorant to understand this. It's inexcusable unthinkable that knowledgeable Democrats would rally behind this woman's idiotic resolution. It really shows what a pathetic state the Democratic Party is in today. “How do you take a train to Europe?” Trump joked. That sounds really impressive! Already she has her own House Resolution! Wow! I bet she studied Rules for Radicals. Don't bother - it reads like an 8th-grade term paper. An 8th-grade term paper that was graded an F because it is so outrageous. Co-author of the resolution, Edward Markey, should be ashamed of himself for putting his name on that ugly heap of trash! Has Ocasio had anything to say about National Emergencies"? What does the MSM think about National Emergencies? Could a President Ocasio declare that her ideas must be implemented because big feet made out of carbon (like Algore evidently has, and maybe Ocasio too...) have created a National Emergency? Or worse?